سواءً كنت مسافراً بغرض السياحة أو العمل, Meridian Port Douglas Hotel هو خيار عظيم للإقامة خلال زيارتك بورت دوجلاس. إن موقعه الجيد الذي يبعد 2 km فقط عن مركز المدينة يساعد النزلاء على الاستمتاع بمعالم المدينة ونشاطاتها. بالنسبة لمن يريد الخروج، هذه بعض المعالم السياحية المتوفرة للزوار Funstuff by Lynda, اكوموديشن بور دوجلاس, Whileaway. استمتع بالخدمات الراقية والضيافة التي لا مثيل لها بهذا الفندق في بورت دوجلاس. يقدم هذا الفندق العديد من الخدمات الكفيلة بإرضاء أكثر الضيوف تطلباً. لقد جهزت هذه الإقامة الفندقية بعناية فائقة لتوفر مستوى عالي من الراحة. في بعض الغرف يجد النزيل تلفزيون بشاشة مسطحة, حوض الاسترخاء, غرف لغير المدخنين, مكيف هواء, شرفة/ تراس. يقدم الفندق مجموعة رائعة من الخدمات كمثل حوض استحمام ساخن, مسار جولف - ضمن 3 كم, حمام سباحة خارجي, حديقة، لجعل إقامتك تجربة لا تنسى. إن كنت تتطلع إلى إقامة مريحة وهادئة في بورت دوجلاس، فستجد في Meridian Port Douglas Hotel بيتك الثاني. Sue and John were excellent, very helpful with organising tours and transport for us. The room was perfect clean and and everything you needed. Location was great 5 minutes to the beach and 5-10 minutes walk to shops and restaurants. 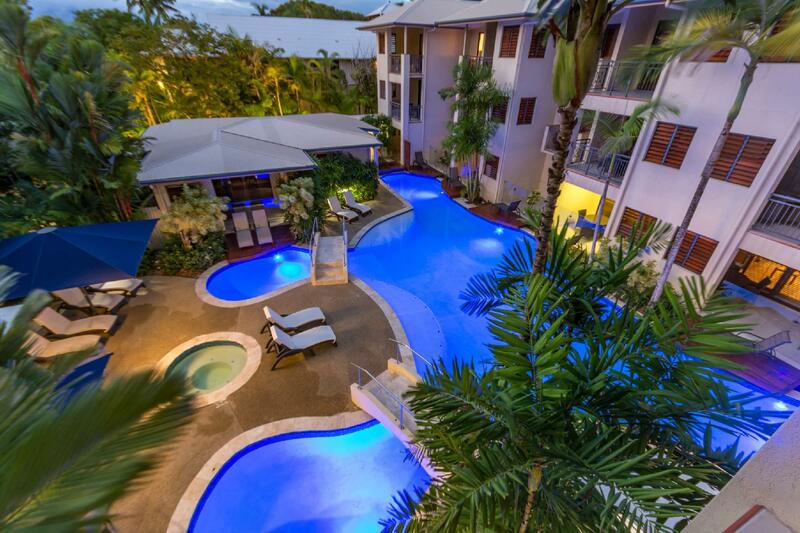 Would definitely stay at the Meridian Port Douglas again. We stayed at Meridian for a week and absolutely loved the place. It was a great location close to everything. Everything was provided in the room and all facilities worked well. The staff were always helpful. If I was staying in Port Fouglas I would definitely stay there again without hesitation. Great location. Friendly helpful staff. Would stay here again. Only thing lacking for me was a fitness centre but there are plenty of activities and walks to do in PT Douglas so it's not a big deal. Recommend their tour booking service. Stayed 5 days but no room service - thankfully they gave us heaps of towels. Excellent location and facilities we would stay there again. There were many local cafes and restaurants nearby and the room had great self catering facilities. We were advised about a problem with the plumbing in our room before our arrival and were requested to change rooms for the last night and given 50% refund for that nights accommodation. The request/move did not affect our stay. Staff were friendly and helpful and would stay there again. Perfect for a 4 day getaway with husband - no kids in resort which was great in school holiday time and meant pool time was quiet and relaxed. Perfect location walking to everything in town, main street and marina. We stayed in a 1 bedroom apt and had a lovely balcony with day bed so we could chill out in private and also be outside when the tropical rain came down. Good size apt, with kitchen facilities and laundry if needed. Def recommend. Rooms were clean and comfortable. Pool area wasn't anything special, but it was enough for my needs. We stayed in a studio direct pool access room which had just what we needed, small kitchenette, dining table, full sized bathroom with tub. Had access to the pool from the decking which also had an outside table and two deckchairs. The pool was spacious and clean, being a 15+ resort it was always lovely and peaceful. The hotel is in between four mile beach and Macrossan street so walked everywhere. If you are looking for somewhere central to stay, and don't need the bells and whistles of a full serviced resort then the Meridian is highly recommended. Very very good as long as the manager was not disturbed on his phone during reception hours Very disappointing when you feel ignored!! The Lift, close to main street and the beach. Arrived about 6PM from Cairns no problems with getting our key etc owner very helpful. Parked our hire car in basement and thank goodness they had a lift as our room was on the second floor. Our Room was very clean neat and tidy with a small fridge, toaster, microwave oven kettle and cutlery. Just outside of our room was a share between 2 rooms a washer and dryer and small sink, very handy. The pool was a good size though we did not use it along with the BBQ. There appeared to be plenty of car spaces available. One block back from the main street and about 2 blocks to the 4 mile beach. Value for money, Quiet surroundings, close proximity to town. If you want a relaxing holiday then stay the Meridian. It's close to the main street of Port Douglas (5min walk) with the wide variety of restaurants and services all within walking distance. Supermarkets, banks, shops etc are all there, while there is a wide range of eating options catering to all tastes and budgets. My girlfriend and I ate at a different place each night. The hotel is set in a garden setting, and even though you're on the main road into Port Douglas, you never notice the traffic noise or other noise. It's so quiet and peaceful. The beach is only a few hundred metres from the hotel too. The room was not huge, but catered for everything. A large comfy bed, TV and DVD player, Mini fridge, toaster, iron, all the usual things. A 4-piece dining setting is very handy also. The bathroom had a shower/bath/spa all in one, while all items like soap, towels, toilet paper were well stocked. The room wasn't serviced daily, but can be at an extra cost. This was not a problem for us, as we reused towels, emptied our own bins etc, but may be something to consider. For those with a car, secure, underground parking is provided, but you'll find that you won't need it all the time to get around town as everything is so close by. I wouldn't think twice about staying at the Meridian again. It's a quality hotel at a very affordable price. no children, beautiful apartment, great pool area. My wife and I are in our mid fifties. We stayed in a superior 1 bedroom apartment 10A on the 2nd floor of a 3 story complex. 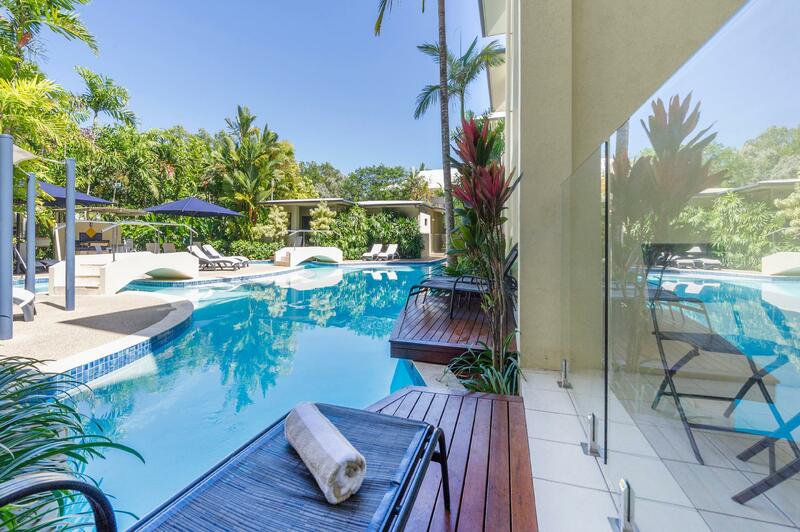 Beautifully furnished, fully self contained apartment overlooking the pool area. We spent 10 nights here and loved every minute. It had a large balcony with a round table to seat 4 people plus a 2 person Spa on the balcony screened for privacy but still having an outlook over the pool and Tropical gardens. large living room and bedroom with a King size bed. Terrific kitchen and bathroom. Has an elevator if stairs are an issue. We wanted a quiet well appointed fully self contained place, close to shops and restaurants which is 2 blocks from the main street and 4 mile beach. We did not want a car while we stayed here but does have secure garage under the complex. Everything is within walking distance including the marina for boat trips out to the Barrier Reef. Very highly recommended. 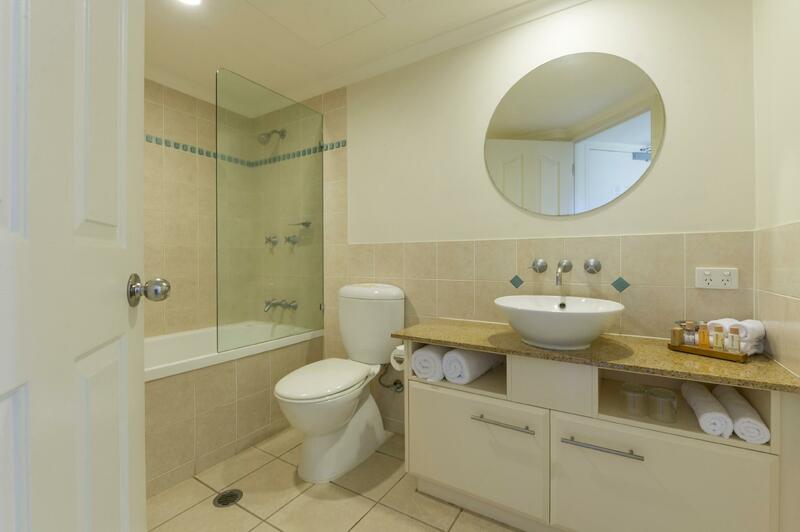 Location walking distance from the main street but away from the noise, nice pool, great underground carpark at no additional cost. It was a pleasant stay. I just wish they cleaned the room in shorter stays than 7 days, as we stayed 4 nights and would have liked not to have to throw my own garbage out myself while on holiday. It would also be a plus if they served breakfast as the self contained apartment is not a value for money option when there are so many other hotels with breakfast option included (and for the same price). Amazing room, we had a room with the spa on the balcony and it was to die for!! Better than the swim up rooms. We were lucky enough to get a corner room too so i think it was a bit bigger. Tour desk lady was brilliant and organised everything we wanted. Highly recomend this hotel!!! Location, value and friendly staff. The staff were very helpful and friendly. Port Douglas is beautiful! Nice quiet area, convenient for everything. First impressions of the complex were average, and some signage regarding where to park and check-in would help. The apartment however was spacious and most overlook or have access to the pool. Cooking facilities were slightly less than we expected, but adequate. Everywhere in the complex was kept clean and tidy, and the staff polite and helpfull. The beach, the port, and Macrossan Street are all a short pleasant stroll away, so if you don't have a car, once you get there everything is very handy. There are certainly flashier looking complexes in PD but we were very satisfied with our week at the Meridian. upon arrival we were early,but the staff member was very accommadating she took care of our luggage and gave us a map and then proceeded to explain what was in town and asked us what type of food we prefer and then told us the best spots that would suit us. when we returned when our room was ready we were excorted to our room by the staff member and asked if the room was okay. the room was very comfortable, it was nice to sleep in a comfortable bed. it was great having the pool come up to the room it was a real convinence. having your own laundry service was also a good perk a little more sun shine around the private deck area would of been better.already decided to stay next year.